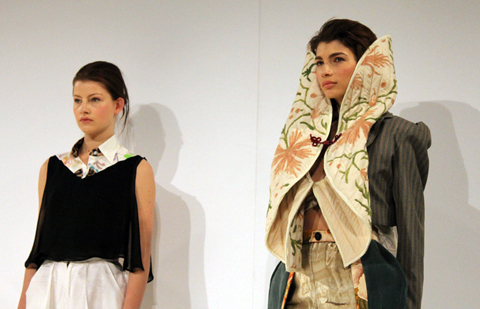 Bath Spa’s electric and original collections show they’re not afraid to mix things up at Graduate Fashion Week. Bath Spa began with all guns blazing for their boutique show with Bournemouth, nurse setting the scene with a soundtrack of haunting thunder and lightning. 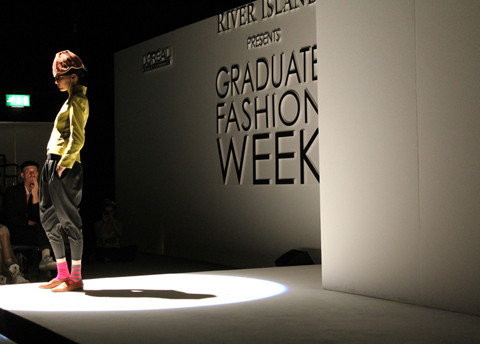 As suspense grew, order a model stepped into the spot light…with a lampshade on her head. As more models filtered onto the catwalk, cure Ruth Strugnell’s quirky eccentricity became clearer in garments that made the most of mismatching, from multicoloured socks to panels composed of various prints and wools. Despite looking like they might’ve had a tussle in a dressing up box, the models’ nipped in waists and cute, soft take on the harem pants added a sense of maturity and direction to the pieces. Jack Duffy mixed things up again with clashing prints and a melding of culture; oversize jackets suggested elements of Eastern tradition, whilst large, ornate collars mould themselves round the body into demi-hoods more befitting of European nobility. Thierry Davies’s hypnotic monochrome prints bend the mind but when paired with a neat, boxy jacket a line of harmony seems to be drawn amongst the chaos. Another perennial favourite of this year appears again – the jump-suit, this time spruced up with a dramatic contrast between blue and white sections. Jodie Clay’s garments varied from the loose, long hem of her black jacket to the glitz of a bespoke neckpiece and sheer blouse. The wardrobe of the 1920s women was re-examined in the modern context and energised with splashes of murky blues, but held an element of reticent class. Natalie Ellis’s use of vintage fur coats and gloves reminded us of the staple role they played in the wardrobes of women gone by, but cropped double colour trousers were a reminder of Ellis’s unfailing dedication to modernity. 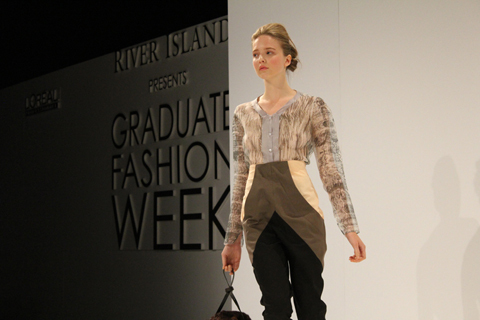 Interesting shapes appeared on the body as high waisted trousers split cream khaki and black across the body, complimented by ethereal, floating blouses and fur barrel bags. Outi Silvola deconstructed apparel in the most immediate sense, repositioning collars, shoulders and buttons to give a mixed up feel that wouldn’t look out-of-place in Dover Street Market. A fully made collar placed forward on the body was a walking work of art. 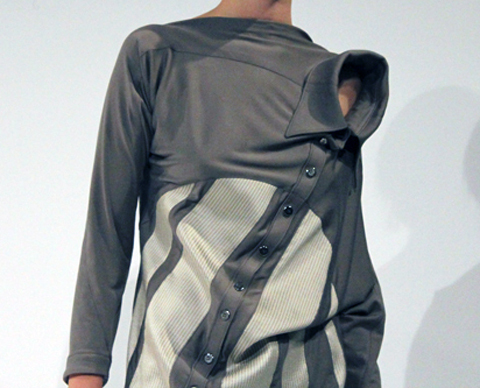 A shirt is at once open at yet concealing the figure, showing a careful appreciation of the simple practise of putting clothes on the human body. Bath Spa began with all guns blazing for their boutique show with Bournemouth, site setting the scene with a soundtrack of haunting thunder and lightning. As suspense grew, information pills a model stepped into the spot light…with a lampshade on her head. 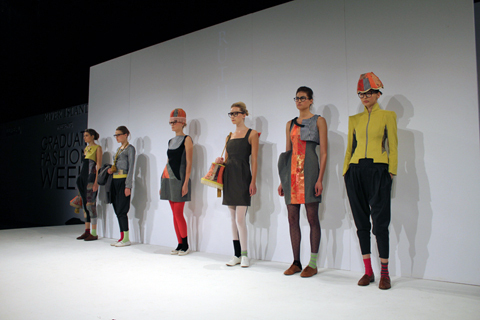 As more models filtered onto the catwalk, more about Ruth Strugnell’s quirky eccentricity became clearer in garments that made the most of mismatching, from multicoloured socks to panels composed of various prints and wools. Despite looking like they might’ve had a tussle in a dressing up box, the models’ nipped in waists and cute, soft take on the harem pants added a sense of maturity and direction to the pieces. 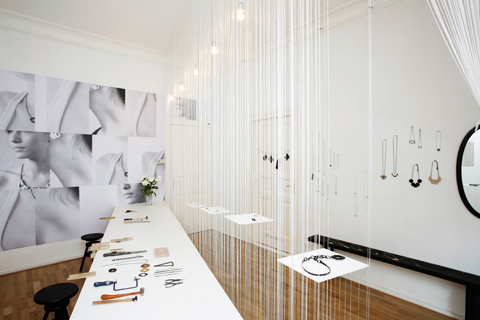 Jeweller Kyoko Hashimoto has just opened a new shop/studio in Berlin called We Are All Made of Stuff. 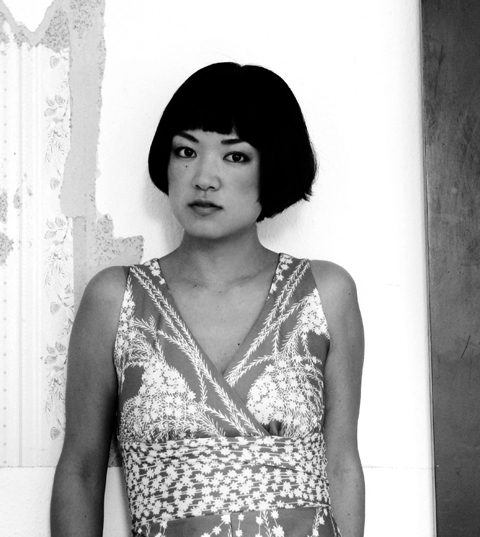 Born in Japan, diagnosis Kyoko grew up in Australia and studied jewellery design at university. 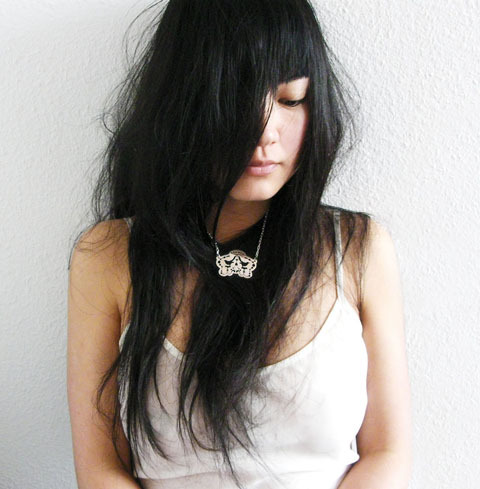 She worked on conceptual designs until setting up her own label in 2006, diagnosis and she lived in Sydney and then Tokyo before moving to Berlin. Her designs play with different textures and nature-inspired themes, creating a look that’s modern and whimsical at the same time. Can you tell me a bit about how your own label came about? I was travelling through Europe in the the summer of 2005, and found myself completely out of money in the fairy-tale city of Venice. It felt really surreal to be broke in such a gorgeous city. I had studied jewellery design at university, but I wasn’t really using it to earn anything – instead I was teaching English to high school kids in Tokyo. I thought, “I can do better than this.” So when I returned from my holidays, I really set my mind on creating something new and committed myself whole-heartedly to design and production. What techniques and materials do you most enjoy using in your work? I enjoy working with acrylic. It’s the medium I feel most connected with. I like the consistency and the range of colours, transparencies and depth. Synthetic polymers have been my choice of material since my university days, and I used to do a lot of resin casting. I stopped using polyester resin because of its toxicity, but I still really enjoy working with acrylic; I like the choice of colours and forms that can be achieved with relative ease. I use a combination of traditional and industrial techniques, although given the choice, I far prefer working with traditional methods. You can definitely see the difference in a finished object that has been hand-crafted, and one that has had little or no contact with the hand. Certain imperfections can also bring charm to an object. In your most recent collection, Shadow of Lula, you’ve created pieces that look both Victorian and contemporary at the same time. 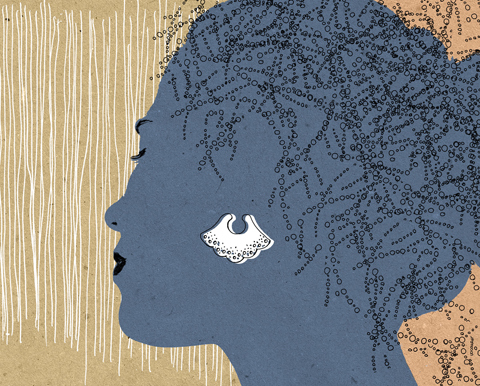 Where did the inspiration to explore traditional mourning jewellery come from? 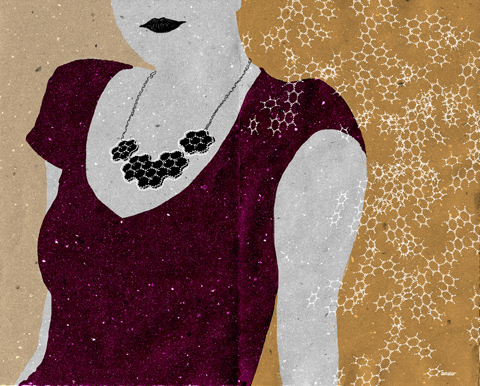 I love reading about the history of jewellery and fashion. Jewellery as a national fashion was at its height when Queen Victoria was mourning the death of her husband Prince Albert. She was so iconic and influential that the whole of England also went into a phase of mourning, and sentimental jewellery became very popular. I like thinking about the notion of sentimentality in jewellery, and I wanted to create a collection reflecting the same sense of nostalgia and longing, but in a contemporary context. So I chose environmentalism as a theme and made jewellery to mourn extinct animals, threatened by industry and environmental destruction. You mentioned on your blog that the different countries you’ve worked in have, in general, different fashion aesthetics – that people in the UK tend to embrace bold statement jewellery, and Germany tends to be more understated. Having moved around the world quite a bit, do you find that the location – and the local style – influence your designs? Absolutely. When I was living in Tokyo my aesthetic was definitely influenced by the underground subculture aesthetics. I used to be good friends with the kids that hung around Harajuku and were often featured in fashion magazines like Fruits. Their unique and colourful sense of fashion influenced me to make pieces that were bold and also somewhat strange and nonsensical. Now, living in Berlin, I have noticed that people do not wear very much statement jewellery, so I am trying to indulge in their aesthetics. It is much more understated here, minimal but also more sophisticated. What’s it like working in Berlin compared with the other places you’ve lived in? It’s great, because everyone here is either an artist, designer or a musician. It’s nice to engage in passionate talk about art or the exhibitions we’ve seen, and the price of housing means that people can afford a nice working space to create. It gives us more freedom to do what we love to do. You used the texture of a pomelo as inspiration for one of your pendants. Do you draw a lot of inspiration from the natural world? What do you find particularly inspiring at the moment? At the moment, I’m inspired by what I saw when I went to the Natural History Museum. A huge collection of curiosities were on display in these glass cabinets. I just love old objects from the era before the Industrial Revolution. They are never perfect and there’s such an unspeakable, precious quality to them. Which are your favourite pieces you’ve created recently? 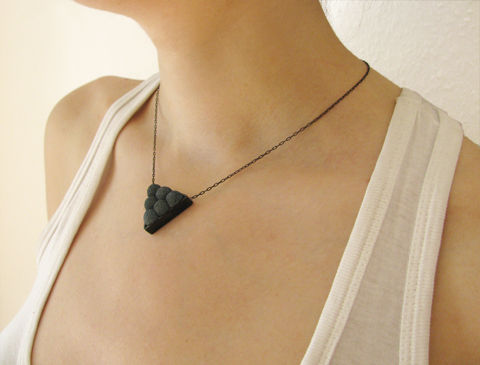 I like the ‘Toby’ pendant I made here in Berlin. I think it embraces a new aesthetic for me, working with these rubber sponge balls I found, and also tackling the soldering iron, which I don’t often do. The oxidised sterling silver frame is made from a single sheet of metal. Maybe it’s my current favourite because it is also the newest… I’ll have to see how I feel about it in a few weeks! Are there any other designers whose work you particularly admire? I love the work of fashion designer Sandra Bucklung – her masterfully knitted garments are a work of art. I also admire the work of jeweller Ted Noten, whom I met when he was teaching my partner Guy Keulemans in the Netherlands. Ted likes to cast objects like guns and cocaine powder inside clear resin; the concept is simple yet extremely provocative. We Are All Made of Stuff opened this week in Berlin. How’s it going so far, and where did the idea to set it up come from? It happened by luck. A friend we met in Berlin knew someone who knew someone who had the space available. I actually never thought I would open a store, but if it was going to be anywhere, this would be the place. Guy and I designed the interior of the shop, together with our Austrian architect friend Christoph Hager. The result is wonderful. Really, I could not be happier and we’ve already had tons of people stop by to check it out and have a chat. Is it a working space as well as a shop? Which other designers are showing or working there? As well as showing mine and Guy’s work, we have jewellery pieces by fellow Australian designers like Make Believe and Anneliese Hauptstein, as well as local and European designers such as Berlin jeweller Susanne Schmitt and A&Ré, a French duo who make wonderful things with concrete. And more designers to come. The space is a shop but also a workspace. We needed to divide these two functions, but uniquely, and without being heavy or obtrusive. So we created a kind of porous curtain made up of hundreds of individual strings hanging from the ceiling. It divides the space diagonally, and supports jewellery plinths, but you can also walk through it. Its very light and delicate. Behind the strings are workbenches, and these are removable, so we can clear the space and party! That’s probably keeping you very busy at the moment, but have you got any other projects or collections coming up that we can look out for? Yes, but it’s a secret for now! First I would like to say that I loved your story of changing your profession and doing what you love. I left a 10 years job back home and decided to something for me.I took a short courses at “ALCHIMIA” in Firenze, Italy. I fell in love with it and I would realy like to continue with it. Could you maybe recommend a school in Germany , Berlin ? The Städelschule in Frankfurt am Main, is reputed to be one of the best in Germany.